Have you ever been so unhappy that you cried all the time? So depressed you didn’t want to eat? Not just for a few days, but for years. Not because of something minimal in your life, but because of a situation that caused great grief? Have you ever been taunted, teased, bullied and harassed by someone because of the issue that caused you such great grief? Not just on occasion but for years and years? Have you ever been misunderstood and even ridiculed by someone of great importance when you decided to take that grief to the Lord? 21 The man Elkanah and all his house went up to offer to the LORD the yearly sacrifice and to pay his vow. But Hannah did not go up, for she said to her husband, “As soon as the child is weaned, I will bring him, so that he may appear in the presence of the LORD and dwell there forever.” Elkanah her husband said to her, “Do what seems best to you; wait until you have weaned him; only, may the LORD establish his word.” So the woman remained and nursed her son until she weaned him. And when she had weaned him, she took him up with her, along with a three-year-old bull, an ephah of flour, and a skin of wine, and she brought him to the house of the LORD at Shiloh. And the child was young. Then they slaughtered the bull, and they brought the child to Eli. And she said, “Oh, my lord! As you live, my lord, I am the woman who was standing here in your presence, praying to the LORD. For this child I prayed, and the LORD has granted me my petition that I made to him. Therefore I have lent him to the LORD. As long as he lives, he is lent to the LORD.”And he worshiped the LORD there. This is a beautiful ode having the poetic beauty of a song, as Hannah prays after giving her young son to be raised to be a great man of the LORD. 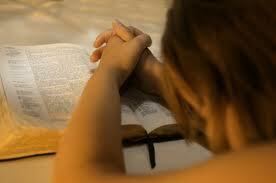 And Hannah prayed and said, “My heart exults in the LORD; my strength is exalted in the LORD. My mouth derides my enemies, because I rejoice in your salvation. “There is none holy like the LORD; there is none besides you; there is no rock like our God. Talk no more so very proudly, let not arrogance come from your mouth; for the LORD is a God of knowledge, and by him actions are weighed. The bows of the mighty are broken, but the feeble bind on strength. Those who were full have hired themselves out for bread, but those who were hungry have ceased to hunger. The barren has borne seven, but she who has many children is forlorn. The LORD kills and brings to life; he brings down to Sheol and raises up. The LORD makes poor and makes rich; he brings low and he exalts. He raises up the poor from the dust; he lifts the needy from the ash heap to make them sit with princes and inherit a seat of honor. For the pillars of the earth are the LORD’s, and on them he has set the world. “He will guard the feet of his faithful ones, but the wicked shall be cut off in darkness, for not by might shall a man prevail. The adversaries of the LORD shall be broken to pieces; against them he will thunder in heaven. The LORD will judge the ends of the earth; he will give strength to his king and exalt the power of his anointed.” Then Elkanah went home to Ramah. And the boy ministered to the LORD in the presence of Eli the priest. Hannah’s song of praise (prayer)…I need to read this EVERY day. Thank you, Stephanie. I know, it is truly beautiful! I was just sitting out in the cool night air thinking the same thing Cheryl! Even if we are not depressed, grieved or bullied, there are lessons for us here. Whatever we face, whatever happens, we **KNOW** our God cares for us and WILL undertake for us in His way and He will use the experience to “grow” us. Yes I agree with all that I am in Him. What the Lord was showing me is how so many that are lost, lonely, depressed can have hope “in the salvation of our loving ever merciful God”. Had a friend near to my daughter’s boyfriend take his life this morning. He left a wife, a daughter and a grand daughter. Who knows why?